It’s not every day we hear tell of Finland, so a juxtaposition of Ilmiliekki and Finnish education within 24-hours was notable. 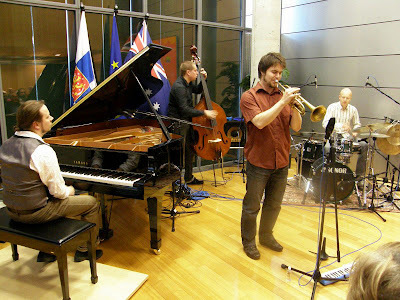 Ilmiliekki is a capable, young jazz band that is visiting Australia for Wangaratta and more. 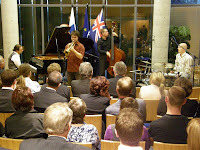 They performed for a private audience at the Finnish Embassy, and I was lucky enough to get invited. ArtSound was there recording, so the concert won’t remain so private. The other side of the equation was Finnish education in the context of Rudd’s education revolution, which was discussed on Radio National the following morning. The speaker was praising Finland as having the most successful education system in the world. 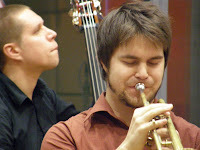 Certainly, the jazz was capable and interesting and displayed good training, and the introductions in English (my take on the education system) were better than any of us would be likely to manage in Finnish. This was jazz in the Euro tradition: elements of folksong and images of snow and mountains, and a clear link to the Western fine music tradition. I noticed the classical links mostly in the piano playing, which was more dense chords and close voicings and atonal as in 20th century fine music style, rather than linear piano lines which mimic sax. 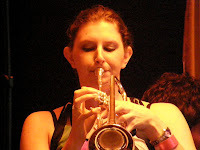 The trumpet was more of the linear style of scalar fragments and figures, but there was also play with strained and muffled articulations, bent notes and the like. 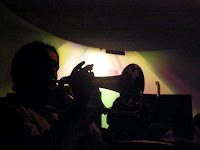 His was a concern with purity of sound and this was shared by the other members: not flashiness, but unity and connection in the performance whole. 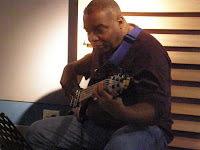 The bass often enough played repeated, hypnotic patterns but also dropped into improvised straight feels. 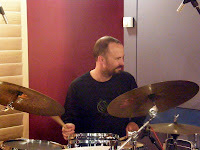 The drummer (on his fourth tour of Australia, so already a mate) played minimally at times, but also raised and sustained tension at other times by leading the busy-ness of the ensemble. It was this ensemble playing, rather than individual playing that defined the sound of the band for me, and this just seemed to fit the folk affiliation I mentioned above. The band started with a tune by Tom Waits, bluesy in melody and harmony and played with simplicity but also with emotional strength. 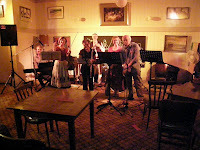 There were several originals: a Bb pedal piece, some folk-influenced melodies. A mate observed that only the last tune modulated: it was by Ornette Coleman. He was impressed that interest was maintained through the other tunes with simple underlying structures. But this, to me, is the extended, inward-looking style which I identify with Northern Euro jazz. So, in summary, a very satisfying concert of considerable seriousness with capable ensemble playing. And a nice way to warm up for the chatter and drinks at the Embassy reception to follow. 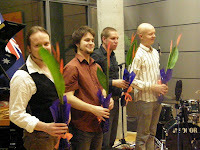 The Ilmiliekki Quartet is led by Verneri Pohjola (trumpet) with Tuomo Prättälä (piano), Antti Lötjönen (bass) and Olavi Louhivuori (drums). 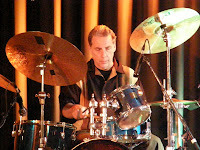 There were lots of chops, lots of watts, lots of dots, when Wayne Krantz came to town with Tal Wilkenfeld and Keith Carlock. It was one of those events organised through the music industry, so I expected capable playing without too much profundity. There was certainly lots of energy. 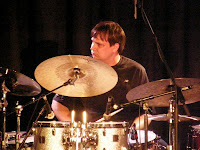 Keith Carlock was endlessly busy, with sticks rising above his head (great for the photographers) on a kit with the skins strangely angled down and away from him. I don’t remember him letting up for the full two hours. I only heard Wayne clearly when I moved to a seat on his side of the stage for the encore. He certainly played a unique style, and it was interesting. Unusual lines and constant effects. 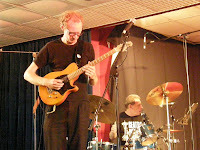 I hardly understood what Tal was playing although it wasn’t from lack of volume. I caught some quick and nifty lines, but I was not the only one who said they hadn’t been able to hear her. 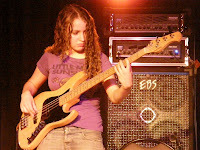 She played several solos. One was melodic, but some others were more playing with effects. I much prefer her playing on YouTube with Jeff Beck, where she does a tasteful and tuneful solo on Cause we ended as lovers. Tal often sat out for a time, leaving guitar/drums combinations, and similarly guitar sat out to leave some bass/drums segments, but the dynamics never changed. Not exactly true: there were a couple of spots where Wayne played solo to introduce a tune that were on just 5, but then it returned to a relentless 10 on the dial. Not quite 11. The audience seemed to be listening with their eyes, and strangely immobile. At one stage, I noticed a shaved head nodding, but that’s when I realised how static the rest of the crowd was. So I was left uninvolved and I was actually glad when it was over. It all seemed so relentless and unmoving. Lots of energy but little purpose that I could identify. I asked around after, and there were several people whose playing I respect who were positive, but even they seemed to express it with little enthusiasm. Perhaps it’s just horses for courses. Feel free to add your comments. I’d actually like to hear why people liked it, if they did, but just don’t get cranky with me for finding it all signifying nothing. 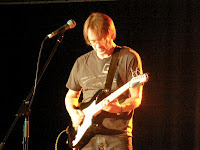 Wayne Krantz (guitar) led a trio with Tal Wilkenfeld (bass) and Keith Carlock (drums). 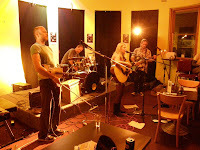 Michael and Anna returned to Canberra last Friday for an ArtSound Friday Night Live broadcast with friends gathered round. It’s for good reason that the band is called Inner Circle. 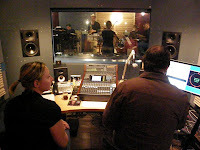 I was in the studio for the second set, and it was a warm and friendly atmosphere. 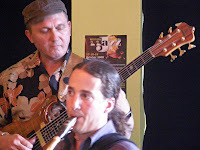 These guys (I’m including Anna here) have played together in various combinations in the past, and the experience showed in capable, tuneful and vigorous playing over quality original tunes. I found Michael less abandoned and dissonant in his playing than I remembered him, but then I often used to hear him in situations where he could let his hair down. 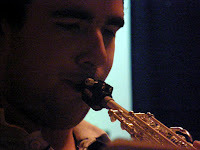 He played some virtuosic solos, with both inventive diatonic playing and diversions off into dissonance. Lovely. Niels played with the tastefulness we’ve come to expect from him, but let go for a frenetic solo on the last tune, the exciting Eighty eight keys to happiness. 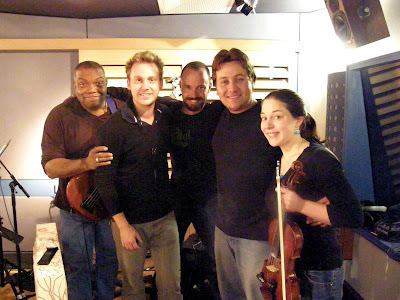 Bowed strings bring a very different identity to jazz. 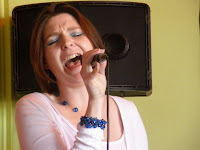 Anna supplied several intriguing and obviously sensitive tunes to the band, with personal, even socio-political, themes (The journey was about a refugee). I liked this and liked the purposive nature of the bow in this context. Chris and Eric were obviously enjoying the situation, and playing with understanding and direction and openness. 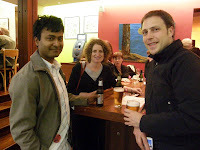 This is just a short report to catch up, but this was a welcome if short visit by departed friends and a night to be savoured. Michael Azzopardi (piano) and Anna Thompson (violin) played with Niels Rosendahl (tenor), Eric Ajaye (bass) and Chris Thwaite (drums). 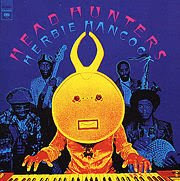 Headhunters must be one of the most famous names in the last 50 years of jazz. 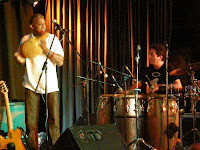 It was a big day in Canberra when the Headhunters and Marc Mittag came for a workshop and some gigs. Sadly, Canberra didn’t quite recognise the opportunity. 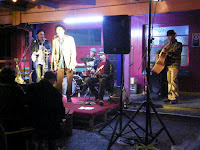 The workshop was pleasantly attended but by no means full, and the story was the same for the first of the two gigs. 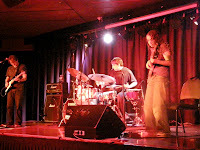 The small numbers gave us an unusual chance to interact with the band, but made work harder for the musos who had to make it all happen with less audience vibe. 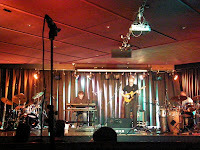 But nonetheless, the playing was fabulous: granite-solid groove with a rich texture of rhythmic and melodic improvisation threaded through the infectious beats. 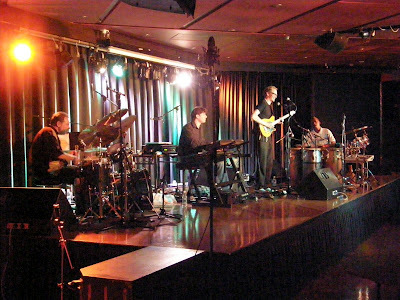 The Headhunters played on several albums with Herbie Hancock in the 70s. 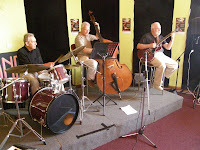 They were controversial at the time and are still doubted by the legionnaires of the jazz tradition, but some of their tunes are amongst the most played in the jazz repertoire (eg, Chameleon and Watermelon man). 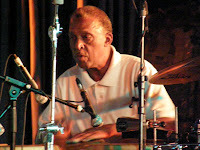 The current Headhunters comprise two members from that period: Mike Clark (drums) and Bill Summers (percussion). 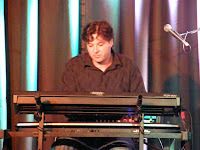 Jerry Z (keyboard, bass) is a recent member, and Marc Mittag (guitar) is an Australian who admired them from afar, and has recently come to record and tour with them. 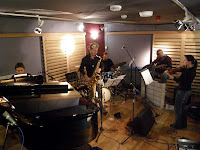 The workshop included several tunes, as expected, and these impressed from the outset with this fabulous, solid, melange of rhythms that merge into that trademark relaxed and rock-solid groove. The workshop was a chance to ask questions and converse with the band members; about listening, technical issues, why they do it, that sort of thing. Here are some things I learnt. “I’ll stay home” means to play really straight when noone else is solid enough on the groove. That was new to me. “Why play the music they do?”, “Because I couldn’t get a job in a bank” (or playing pop music in Madonna’s band … “everyday you get the pay”). 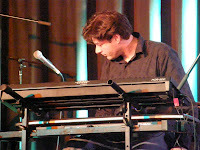 Techniques of playing bass on organ footpedals: heel & toe technique; doubling up on keyboard for sustain, bass bombs for percussive effect. 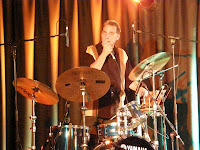 Use of jazz and matched grips on drums. Solos as conversation: listen, respond, instigate. There’s plenty of humour with these guys, and this showed later in the gig as well: about spiders and kangaroos, about birthdays, about those Headhunter mega-hits. But hidden amongst this humour there was a serious side, too. 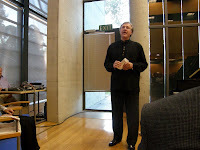 Bill Summers talked of companionship and support and running the world at a personal level, with not too much time for politicians (but then who in the US would have in recent years), and Katrina, and some issues of spirituality. I felt this spirituality at various times: a sweet voice singing African song later at the concert; the immense beauty of Afro-Cuban rhythm which he so capably displayed by playing a string of snippets (songo, rhumbas, etc) on congas as a demonstration. I didn’t know this, but there are over 500 of these rhythms, they have to be learnt in an order, and they all represent things in the natural world, like ocean or grasses or mountains. This was a stunning glimpse of these profound rhythms that we know too little of. This little display by Bill Summers was worth the day for me. 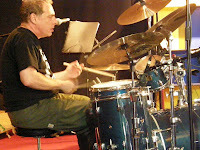 The gig was more polished, but still retained the interactions, the humour and the spiritual side. There were some hits of the 70s. 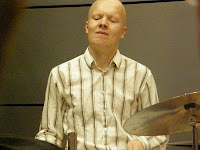 There were plenty of tunes by Marc Mittag that took advantage of this groove. There was even a “Happy birthday, Mama” blues to celebrate Mark’s birthday, and his father-to-be status (due in a week or so … best of luck from CJ). More humour introduced the blues: “What key, Mister Z”, “G”. 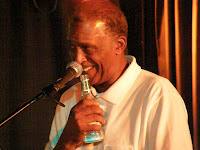 Funk physician, Dr Groove, Mike Clark has apparently played with everyone (except Tiny Tim and Boy George). He talks of asking Elvin how he did such and such, being around when the ride took its role in modern jazz, and the like. This guy was there at the start of funk/jazz (specifically Oakland funk, out of California). I heard complex syncopation, sharp rudiments cutting across and within the beat. Bill had talked of him playing 7,4,9 against the beat, and unexpected counting against complex patterns. Certainly all that. It was a masterful display and got me thinking of this master touring with Hancock, then playing at Top of the Cross. It’s so lucky to hear such a master at close quarters, but also so like the unsparing market system which is musical performance that he was there rather than the Opera House. Bill was the other side of this percussive avalanche. 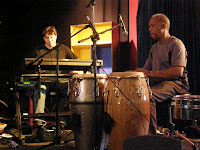 I know too little of Afro-Cuban rhythm structures so they seem deceptively simple. 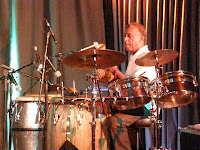 But the earthy hits of the variously pitched congas and cowbells appeared through the more prominent drums to complicate and enrich the rhythm, and this was blissful. Bill also sang a few tunes with a surprisingly sweet and satisfying voice, and was truly profound on an African song where he was accompanied by Fabian Hevia. 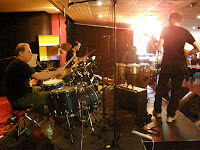 Fabian was travelling with the band and sat in on percussion for this tune. A pianist-friend of mine was at both sessions and spoke highly afterwards of Jerry Z and the independence that was needed for his organ/bass role. He’d never seen better. The tone of the bass pedals is big and fat and soft, not like an acoustic or electric bass, and was boomy for the first part of the gig, but it was perfectly expressive and effective. I lost some of the synthesiser solos, because the balance seemed a bit low after the organ passages, but they were both insidiously involving and intelligently exploratory. There were simple repeated lines, and out discordant lines, and they fitted smoothly into the groove and within the structure of the solos. 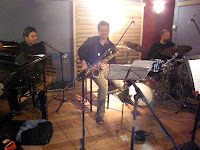 Structure was an issue raised by Marc during the workshop, and was demonstrated clearly in the concert. Start understated, leave style and speed and space for development, build a solo. Like those wavy lines in books that talk of solo development. It was this that was on view along with Mark’s catholic background of country and rock and various other styles he’s played. 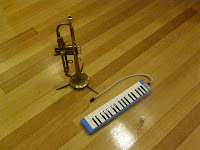 It’s the nature of a working and session musician that he’ll have this background, and this is what I heard, along with his unpretentious, unaffected tone. He was obviously enjoying this time with the masters, and doing a capable job on his own part. Two other items of note. Firstly, this was a generous concert. The guys played 2 sets of 90 minutes each, reaching into the morning hours. 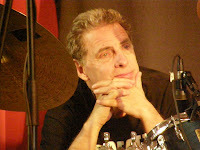 Chick Corea was like this when I heard him many years ago. It’s a level of energy and application which overwhelms. Almost too much. No shirking, and always with that intensity which is clear in the masters. Secondly, this is the first concert I’d attended where you could buy a copy of the concert straight after the gig. 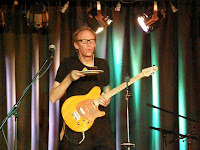 Bill Summers had a portable digital recording rig sitting behind him, and two large diaphragm condenser mics at the front corners of the stage, and was burning autographed CDs of the first set after the gig. This is musos taking back the business. There’s something really true to this groove. It’s got ebb and flow; it’s got levels of interaction and learning and listening. It’s more than what the few underlying chords might imply. This is rich and satisfying groove, and I’ll long remember this day of immersion in the Headhunters. 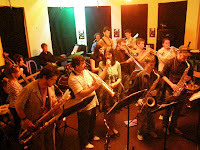 Large ensembles are big, loud, complex and supremely satisfying. 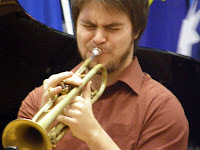 Every jazz nut loves great soloing, but large ensembles are perhaps my favourite. The interaction of parts, the harmonic movements, the diverse tonalities, the rhythmic intricacy, and the unification of all this, which is the composer’s chart. 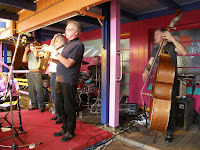 The ANUSM brings all three of its large ensembles to Moruya. 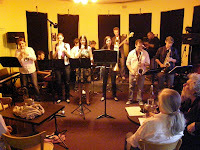 This year, I only caught two: the Commercial Band and the Recording Ensemble. It’s an ongoing game for me to pick a favourite as the bands play each gig, or changes their members or repertoire over time. I loved the hot and sticky Commercials, but the Recording Ensemble got my vote this year. Last year, it was the Commercials. No matter; they’re all fabulous in their own ways. 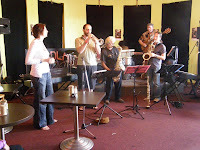 The Recording Ensemble set had a lovely edge of student humour which partly set it apart. 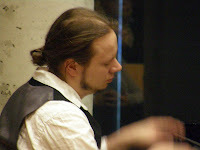 Sebastian McIntosh entertained with droll introductions and Miro was like the proud father at the end congratulating the band for its creativity, but there was seriousness in the original compositions and the performances. It’s clear these guys are friends, and this shows in the music, not just in the repartee. No doubt there’s some competition, but there’s also support for well stated solos and well arranged parts. 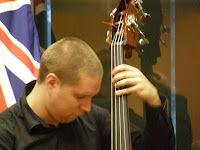 I remember Nick Combe’s impressive Mingus-influenced composition from last year. 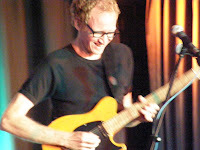 This year, Sebastian joked it was the “Nick Combe Show” after the set started with a run of tunes by Nick. 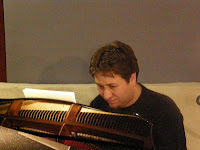 He’s impressing as a strong composer/arranger. 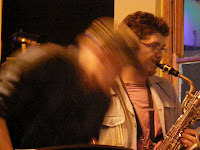 Somehow, performing on the baritone sax just seems to fit this mold. 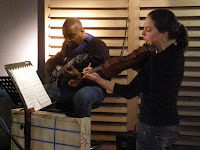 Other tunes were an arrangement of Monk by Kayla Corlis and Matt Sykes’ original composition, River. I also noticed the doubled-up rhythm section. 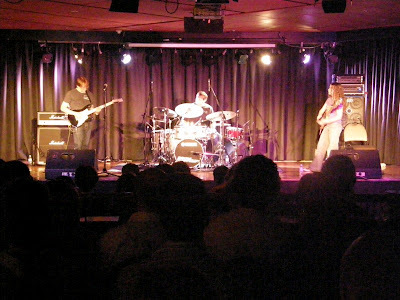 Two guitarists are common enough, but not two drummers and two bassists. 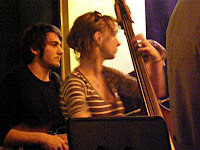 And these instruments (even Chris Pound on electric bass and Hannah James on acoustic bass) often enough played together. It lends another level of complexity, especially to rhythm, and an extended and unusual palette for visceral tunes like River. The Commercials were fast and exciting and hot and sweaty as they should be. This is fun music and challenging charts, and it had the audience braying for more. There was one original here: the band started with Kayla Corlis’ 8 o’clock traffic (a constant source of amusement for bandmaster Eric Ajaye, who’s experienced traffic in LA as well as our rather less challenging peak hour traffic in Canberra). But mostly these are covers or purchased charts. They did their version of Prince’s Thieves in the temple, Marvin Gaye’s spine-tingling classic, What’s going on, and Jaco’s Chicken as their high-spirited departure tune. 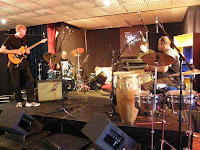 Great fun, hot chops, funky and loud, as this style should be. There was more to the festival than just these bands. I also caught snippets of various other bands, and missed many others. 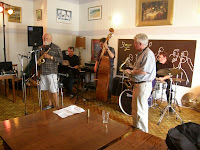 Mike Hallam’s Hot Six and Waiting for Guinness and Syncopators were professional and entertaining and drew the crowds. Spicey Fruit Chutney was folkey and lively and were well received. I just missed or caught just a few bars of old friends Mother’s ruin, and Pierre Kammacher in various outfits and Kooky Fandango. I sadly missed offerings by Lilly Henderson and her dad’s annual funk outing, Turner’s antidote, and Austin Benjamin’s trio playing their own music, and James LeFevre’s latest outfit, and Jo Lloyd’s quintet. Also Moondance, for whom I almost filled in on bass, and who won the audience choice award. I would have liked to have heard All the things you would be if Sigmund Freud’s wife was your mother. With a name like that, it’d have to be suitably experimental. 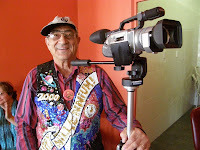 But you can’t catch everything, even at the smallish Moruya Festival, so I take the philosophical approach that I also use when I travel: you should always save something for your return. It’s a much more relaxed way to travel or to attend a festival. Thanks to the Moruya Festival committee for a pleasant few days, great weather, beautiful local beaches, and the loan of your lovely, intimate town as the backdrop for the music. 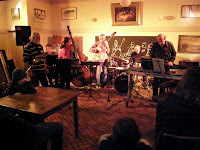 The 12th was another successful festival of jazz and a locum of musical companionship. Thanks from your mates from the moderately bigger smoke, Canberra. Looking forward to next year.